Fotoforms can create a signature theme for your next party or corporate event. Choose Fotoforms to create a “Signature” theme for your next party or event. Using photos of your guest of honor, or your corporate graphics we’ll help you create a one-of-a-kind event! 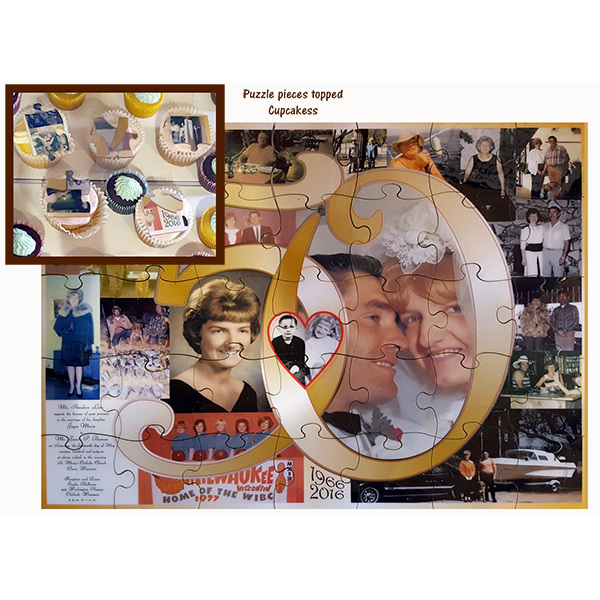 Let us transform your photos or graphic images into Customized or Standard Photo Puzzles, Photo Party Centerpieces, and creative photo party favors like mugs, keychains, magnets or pins. Take a look at some of the great party Fotoforms we’ve created. "Your puzzle is great! We put pieces on cupcakes and guests picked a cupcake and used the pieces to assemble the 50th anniversary puzzle. Thanks!"